Tarot – An art of prophesy that has been practiced from ancient times to this day. Tarot is considered one of the most popular forms of divination. We believe the origins of tarot can be traced to India. Tarot reads the future with cards. There have been special cards that have been developed and used for Tarot readings. The most common Tarot pack used all around the world is the Rider Waite Pack consisting of 78 cards. Hundreds of Tarot packs have been developed since then. There are packs using gods and goddesses, angels and arch angels, nature, magic, mythology, modern art and so forth. The energy of every Tarot pack differs. The themes used in every pack also change the energy of the cards. For example, a Tarot pack of dwarfs will have a very different energy as compared to a Tarot pack of dragons. If you gauge the energies of a pack, you will be able to differentiate the small nuances of each pack. Tarot can throw light on the past, talk about the present and disclose the future. A tarot reading will be able to give a wholesome history of the past, tell you about the current scenario and what the future holds for you. It also suggests the most possible beneficial options for the future. No reader or reading is going to decide for you. The power of decision always lies with you. 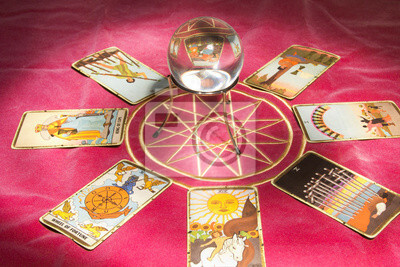 A Tarot reading is not only about revealing problems but actually coming up with solutions and options. A tarot reading guides and assists you towards making decisions. A reading can be done at any time and anybody can ask questions. The cards are the same for all, but the reading differs from person to person. This makes it an amazing and interesting experience.